Here is the first look of Yash Chopra’s next film starring Shah Rukh Khan and Katrina Kaif, a pairing that one could only dream of till now! After about eight years in the industry, Katrina has finally bagged the opportunity to work with the Badshah of Bollywood, Shah Rukh Khan. Yes, you read that right! Director Yash Chopra’s next untitled romantic film stars Shah Rukh, Katrina and Anushka Sharma in the lead roles. The film is special in many ways, as it brings back Chopra in the director’s seat after seven long years (his last was Veer Zaara) and it will also see music director A. R. Rahman pair up with lyricist Gulzar. This will also be Katrina’s first film with Yash Chopra, and the second time that Shah Rukh and Anushka are coming together. It is said that although Shah Rukh and Katrina had been approached for films several times before, they chose to do this particular film because of the impressive storyline. Major parts of the film will be shot in London and India, and will most probably be released around Diwali this year. 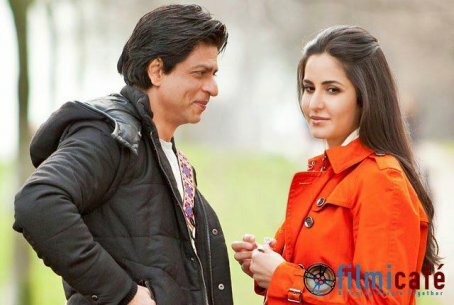 Here is two photo of Shahrukh and Katrina in Yash Chopra’s untitled film from UK shooting set. Don’t forget to like/share us from the left side social bar if you like our photo.